KIRBY, William Fosgate, a Senator from Arkansas; born near Texarkana, Miller County, Ark., November 16, 1867; attended the common schools; studied law at Cumberland University, Lebanon, Tenn., and graduated in 1885; admitted to the bar in 1885 and commenced practice in Texarkana, Ark. 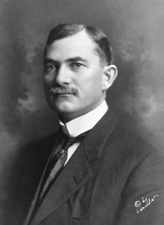 ; member, State house of representatives 1893, 1897; member, State senate 1899-1901; author of Kirbys Digest of the Statutes of Arkansas in 1904; moved to Little Rock in 1907; attorney general of Arkansas 1907-1909; elected associate justice of the supreme court of Arkansas 1910-1916, when he resigned, having been elected on November 7, 1916, as a Democrat to the United States Senate to fill the vacancy caused by the death of James P. Clarke; served from November 8, 1916, to March 3, 1921; unsuccessful candidate for renomination in 1920 and again in 1932; chairman, Committee on Expenditures in the Department of Agriculture (Sixty-fourth and Sixty-fifth Congresses), Committee on Patents (Sixty-fifth Congress); resumed the practice of law; an associate justice of the supreme court of Arkansas from 1926 until his death in Little Rock, Ark., July 26, 1934; interment in State Line Cemetery, Texarkana, Ark. Niswonger, Richard L. William F. Kirby, Arkansass Maverick Senator." Arkansas Historical Quarterly 37 (Autumn 1978): 252-63.